The North West corner of London has been under-represented in terms of parkrun venues, but in the first half of 2015 a cluster of new parkrun events popped up in quick succession around the Watford area giving a few varied options for local runners. Most of the venues are not technically in London, but are within the M25 which kind-of counts. As you will know from the title of this post, this particular post is about South Oxhey parkrun, which takes place on South Oxhey Playing fields (Oxhey Playing Fields according to the welcome sign). But before I get into any parkrun specific information, I've done my best to briefly go over the history of the immediate area that the park lies within. However, not all of the resources I found had matching information so please forgive me for any inaccuracies.. It all starts with The Manor of Oxhey whose earliest reference I could find dates back to around 1007. Then somewhere around the year 1500, The Oxhey Hall Estate is mentioned and this covered approximately 500 acres of land. The Oxhey Hall estate was eventually broken up with a large portion probably merged into the nearby Manor of Wiggenhall. The remaining estate was now known simply as Oxhey. In 1612 a chapel was built and it still stands just a short way south of where our parkrun now resides. The mansion on the estate at this time was known as St. Cleeres. In 1688 St Cleeres was pulled down. In 1690 a new mansion was built in the style of Syon House (which is in West London). Now known as Oxhey Place, it survived for 139 years but was eventually demolished in 1799. In 1877 the estate was bought by Thomas Blackwell of Crosse and Blackwell fame and another Oxhey Place looks to have been constructed in 1910. He was a descendant of another Thomas Blackwell who, in 1706, had co-founded the famous pickling company. By 1912, the area that now forms the park was home to Oxhey golf course, but in 1952 the golf course was closed and the area around it developed into local authority housing. The whole area was renamed South Oxhey and the former golf course became South Oxhey Playing Fields. 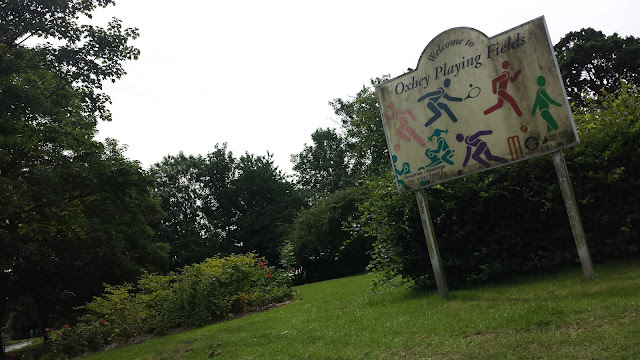 In 1960, while being used as a medical centre, Oxhey Place burned down. 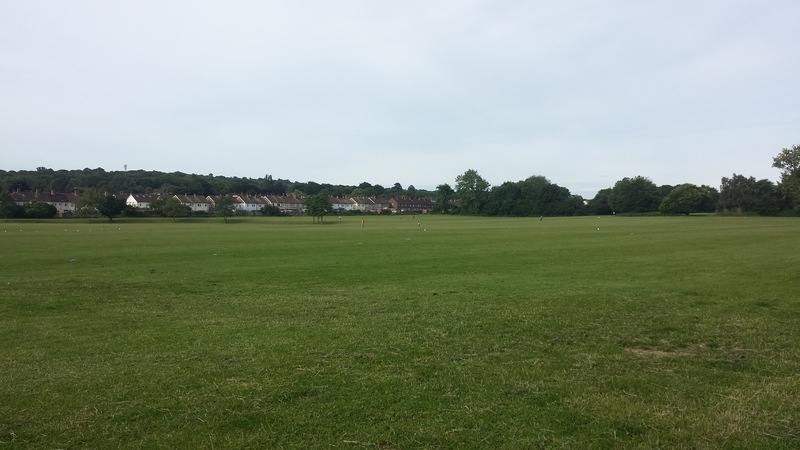 On 31 January 2015, South Oxhey playing fields became home to South Oxhey parkrun. The inaugural event attracted 143 participants, but since then the attendance numbers have generally been around the 30-50 mark. I know the organisers are keen to attract more runners, but with many events attracting hundreds of runners, I found it quite refreshing to visit a venue with a lower headcount. Travelling to the event is relatively straight forward. I travelled over by car and parked in the free car park at the Pavilion pub which is right next to the start/finish area. Had I chosen to travel by public transport I could have taken the overground train to Carpenders Station and walked/jogged the rest of the way (1km). Alternatively, I could have taken a number 8 bus and alighted at Hayling Road which is just a few minutes walk from the start/finish area. Finally, if travelling by bike, I didn't spot any proper bicycle racks by the start, but I could have secured it to the fence outside the Pavilion beer garden for the duration of the run. As far as facilities go, there are some toilets in-between the car park and the park - there are no permanent signs on this building and it doesn't look like a toilet. Fortunately, the parkrun organisers have a big sign that they place on the toilet door. Then when you enter the park, it is an open flat-looking playing field. I'm pretty sure that I could see traces of shapes that looked like parts of the former golf course - or I may just have been imagining it. So, I had a little chat to the core team and found out that they were the people originally looking to start a parkrun in Rickmansworth, but that got canned and they moved their sights to South Oxhey. A couple of minutes before parkrun o'clock the standard parkrun briefing took place. As it is a small venue, the briefing was very relaxed and every single first-timer was individually welcomed during the briefing - you can't do this at larger venues and it certainly added to its charm. We were then lead about 100 metres or so south to the start line. This course is just under three clockwise laps of the eastern half of the park and can be run entirely on grass if you wish. Broadly speaking, the course is shaped like a rectangle. The run starts at the lowest point of the park on a flat section and after the first right hand turn its a long steady incline, passing various outcrops of threes, all the way to the furthest point of the course, which is also the highest point. It only rises 15 metres over the course of 800 metres but it does eventually wear you down. Also the grass is uneven in places and there are molehills to look out for as you make your way around. Once at the highest point of the course it's a good idea to take a glance to back down the hill and admire the nice view, but because of where the outcrops of trees stand, you can't actually see right down to the start area. In fact, from the start area there is absolutely no clue that the route is going to head uphill. The second half of the lap is, of course, downhill. It's not a straight forward even decline; it has sections that dip down and then level out. And once again you have to watch out for uneven ground and molehills otherwise you could get yourself into a bit of a pickle. About half way down, there is a little shimmy where the course cuts through a darker undercover spot which leads out onto the section where the runners have a choice of continuing onto the tarmac path or sticking to the grass. I imagine this will be quite handy in the winter months as those in spikes can keep to the grass, and those in anything else can take a break from the soft (and possibly muddy) grass. This path leads right up to the start/finish area where runners continue around for another lap or, if they are at the end of their third lap, run into the finish funnel, collect a finishing token and get it scanned by one of the lovely volunteers. When I visited, the barcode scanning was being done by a blind lady who was taking a week off running. She had some assistance from another volunteer who gave a verbal description of the type of barcode being presented (mine was a wristband) and it was scanned in the usual manner. It shows that there are always ways to make, not only the run inclusive, but also the volunteering roles. The post-run social is simply a portable coffee van which parks up right next to the finish line. The results were on-line a few hours later. If you're interested in the course profile and all that, my GPS data can be found on Strava. ..... this is the only venue I have visited to date that has the option of chilling in a hammock post-run!